This is another recipe from Annabel Langbein’s Simple Pleasures. I’ve been working my way through this book and found dozens of tempting recipes to try. 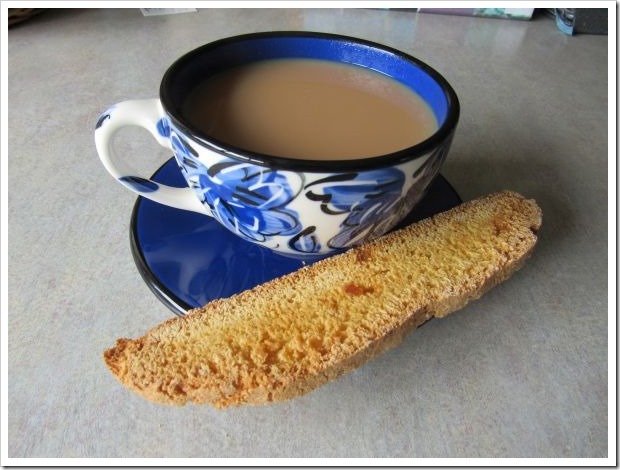 This one for ginger biscotti was a real winner. 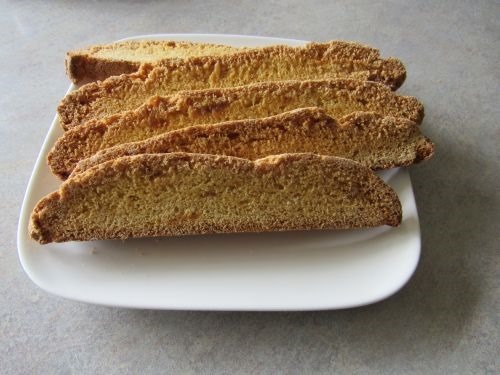 I’ve tried biscotti recipes before, but this one was the best of all. Hubby said so! 1. Preheat the oven to 180C and line a tray with baking paper. 2. Mix ingredients together until you have a soft dough. 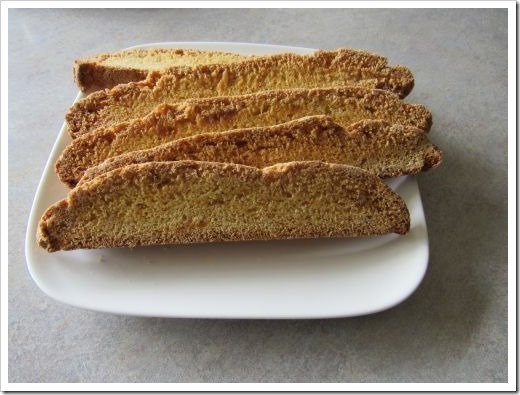 Pat into a log shape – around 23 cm x 7 cm and place onto the tray. 3. Cook until the log is a pale golden color – about 30 minutes. 4. 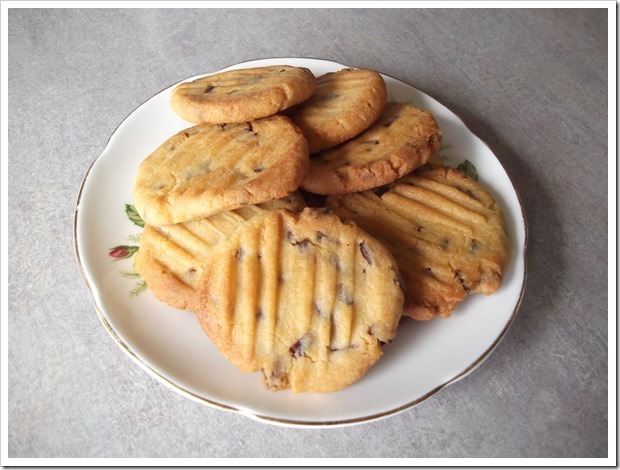 Remove from the oven and decrease the temperature to 140C. 5. Let the log cool until you can cut it without burning your fingers. Slice thinly and arrange on a tray. 6. Bake again until crisp and dry. This should take about 15 – 20 minutes, but the biscuits will become crisper as they cool. 7. Once completely cool store in an airtight container. 1. As usual, my cooking time was less since my oven is on the hot side. 2. I’ll use this recipe and experiment with some different flavors, maybe cranberries and chocolate. 3. 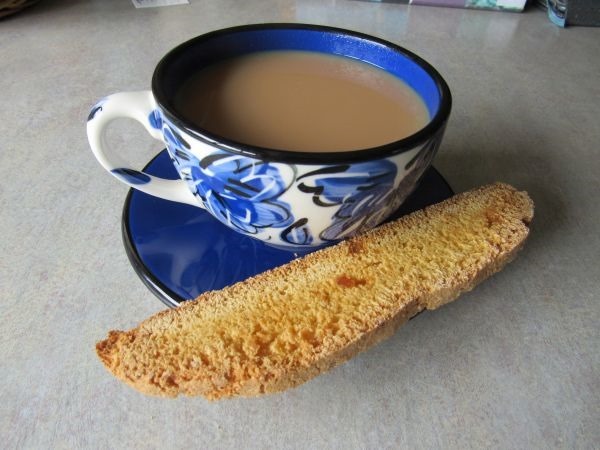 This recipe really worked well, and the biscotti were perfect with a cup of tea. 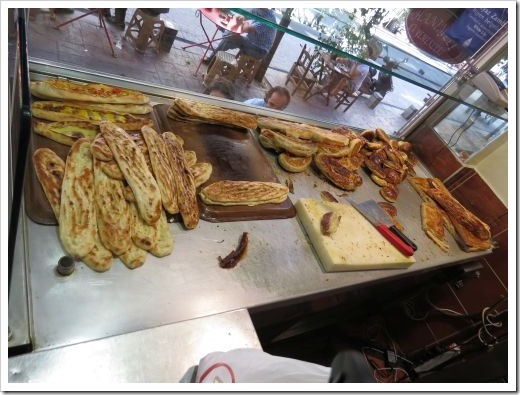 I adore Turkish bread and have done since I first tasted it, still warm from the oven during a trip to Turkey. Locals buy fresh bread every day, and the last time we were in Istanbul, it was fascinating watching the bread delivery. A man walked down the road shouting about his wares. A housewife lowered a basket with money from a second storey home, the man took his money, placed the bread inside the basket and the lady reeled up her fresh bread. Shopping made easy! 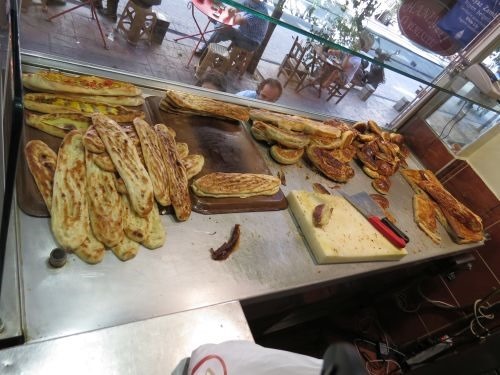 We did a food tour in one of the Istanbul districts, and this is a photo of the shop window where we had a stop. Our first stop, I think, which is where we had breakfast. 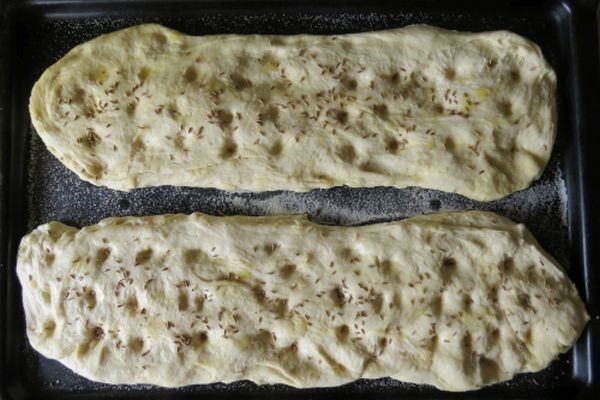 In my quest to try new recipes this year, I came across this recipe in Annabel Langbein’s book Simple Pleasures for Turkish Bread. 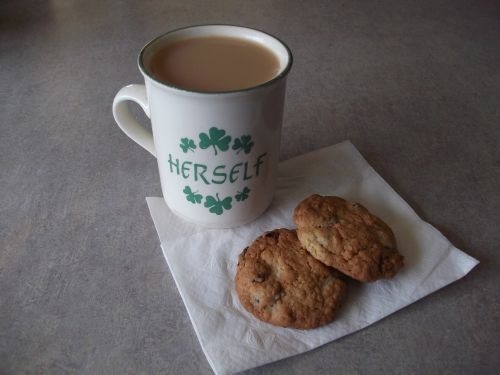 It can be made with a mixer, a breadmaker or by hand. 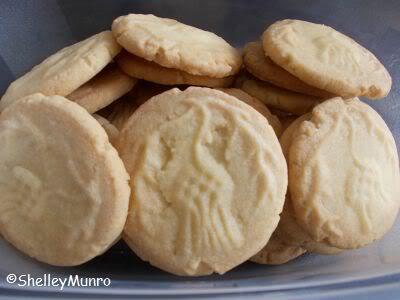 4 1/2 cups flour – slightly more if making by hand. 1. Place the warm water in a large bowl, sprinkle over the yeast and stir in the sugar. Stand for around five minutes until the yeast is frothy. 2. Add the oil and yoghurt to the yeast mixture and combine. 3. Add the flour and salt and mix together until you have a soft and wet batter. 4. If you’re mixing by hand, which I was, add an extra half a cup of flour. 5. 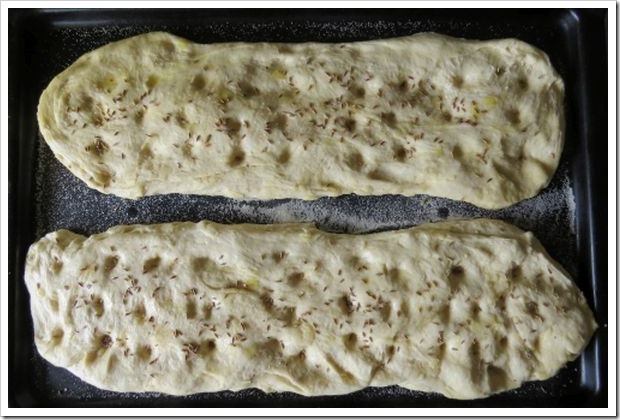 Lightly flour a board and knead the mixture between 20 – 30 times. 6. Return to bowl and cover. Leave to rise in a warm place until double in size – around two hours. 7. Preheat the oven to 190C. Once the dough has doubled, punch it down and divide into two. Use well-oiled hands and shape into two ovals about 2 cm thick. 8. 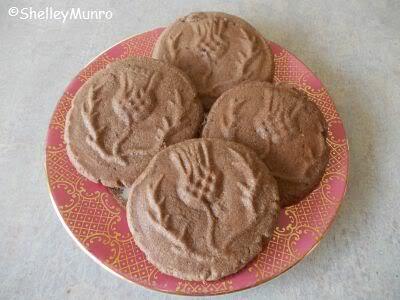 Place on a lined tray and press out. Drizzle olive oil over the top and use your fingers to dimple the top. Sprinkle with cumin and salt. 9. Bake until puffed and golden for around 20 minutes. 1. 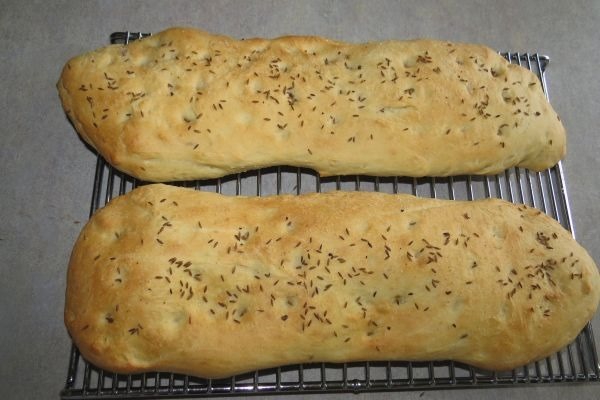 When I make the bread again, I’ll cook it for a few more minutes. 2. Hubby and I had sandwiches and also used the bread to dress up our hamburgers. It would also be perfect with soup, and Annabel Langbein suggested that it would make good crostinis. 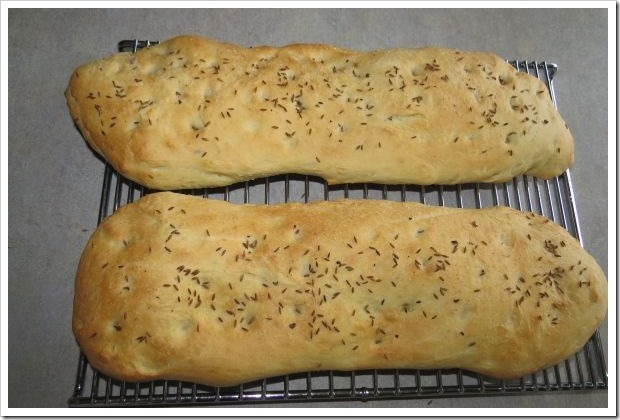 Do you have a favorite bread? This year I’ve decided to try more new-to-me recipes instead of cooking the same old thing every week. To this end, I grabbed two recipe books from the library and started looking for enticing recipes. The first book was Lorraine Pascale’s Fast, Fresh and Easy Food, which I chose because I’ve seen her on the Food channel and enjoyed her recipes. 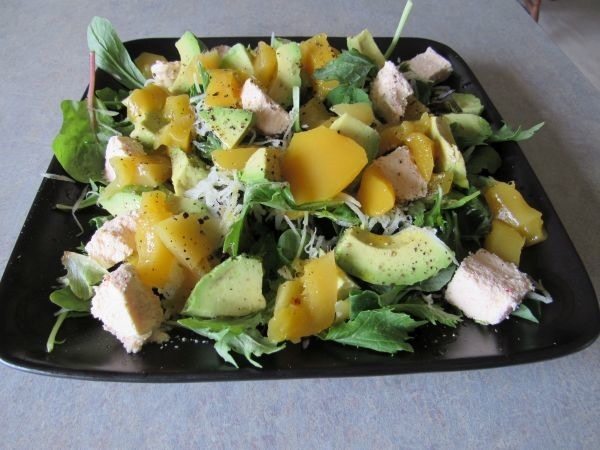 It’s summer here in New Zealand, and with the abundance of avocadoes and other salad ingredients, I thought I’d start with a salad. 1. Place salad greens on platter. 2. Slice radishes. 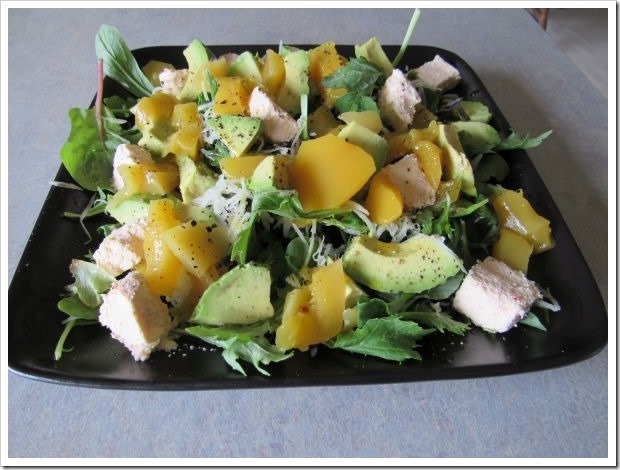 Cube mango, avocado and feta cheese and arrange all on top of the salad greens. Tear the basil leaves and add to the salad. 3. Dress with lime juice and olive oil. Add salt and pepper to taste. 1. I didn’t have any radishes and improvised with some kobari (spelling?) It’s a large radish-like vegetable, which I grated. I think radishes would have been better for the crunch factor and the dash of color would have looked good. 2. Other than that, I enjoyed the salad very much and would make it again. 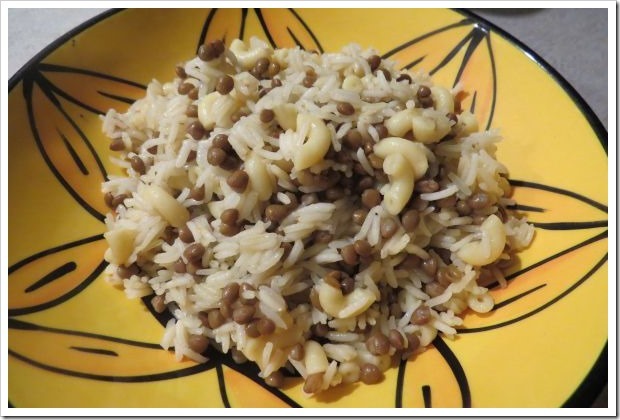 The first time I tried Koshari (a vegetarian dish) was during a visit to Egypt. 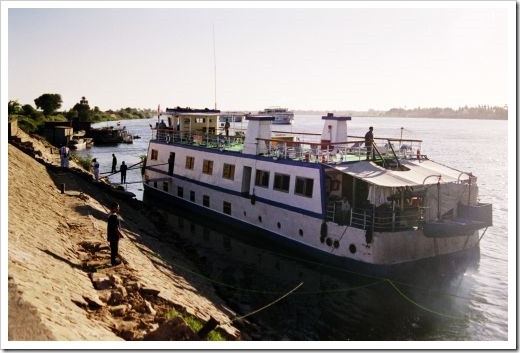 It was a lunch staple on our river boat as we cruised down the Nile from Luxor to Aswan. 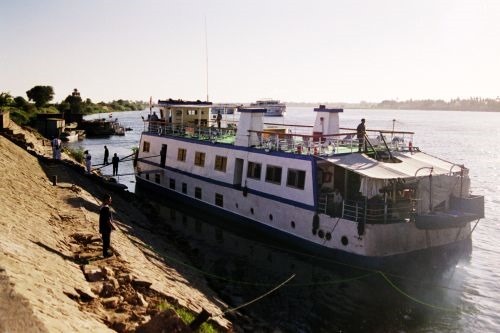 This is our small river boat. The larger, more luxurious boats dwarfed ours, but our smaller size meant we passed through the locks first. 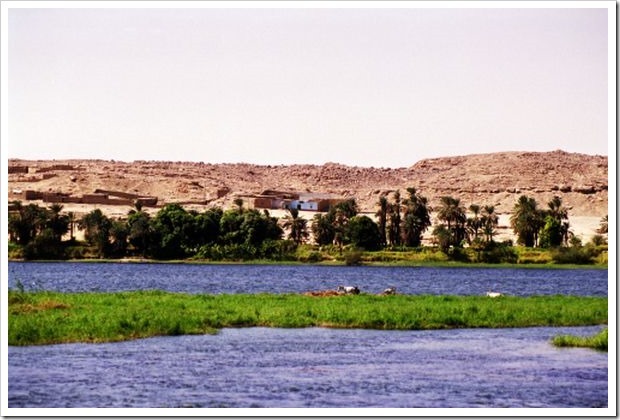 The Nile river brings life to the area. 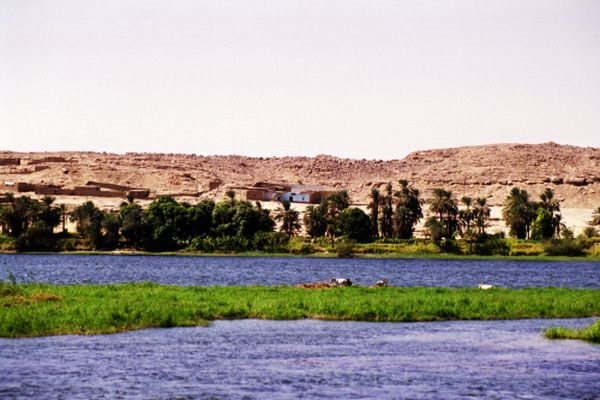 The grass is a vivid green and the crops thrive in the soil with plentiful water, but once away from the river, it’s very dry. 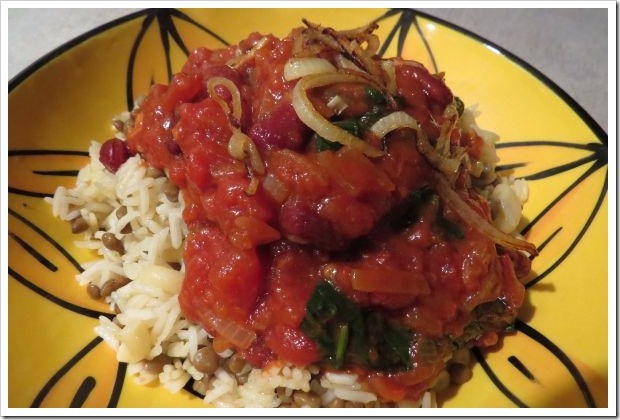 Here is the recipe for Koshari. 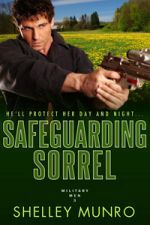 You can buy this online or from specialty stores. I made mine since I had all the available spices in the cupboard. 2 teaspoons smoked paprika, 2 teaspoons ground cumin, 1 teaspoon freshly ground black pepper, 1 teaspoon ground coriander, 1/2 teaspoon ground cinnamon, 1/2 teaspoon ground nutmeg, 1/4 teaspoon ground cardamom, 1/4 teaspoon ground cloves. 1. Heat the oil in the saucepan, add the onion and garlic and sauté until tender. 3. Add the tomatoes and season to taste. Simmer until thickened. Stir in the vinegar and keep warm. 1. Heat 1 Tablespoon of oil in a pan, add rice and stir to coat. Season to taste, then add the stock. Cover with lid and cook on a low heat until the rice is tender and the stock absorbed. 2. 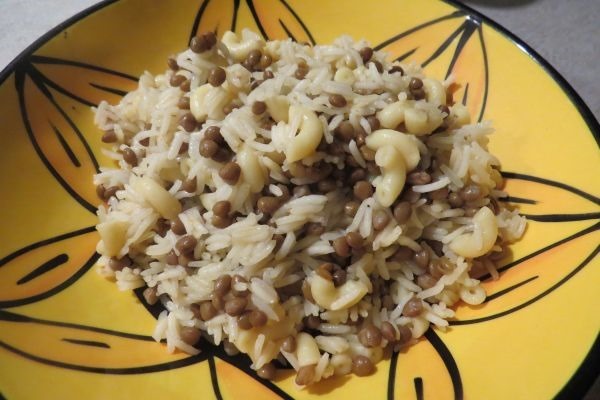 Cook the lentils until almost tender, then add the macaroni. Stir until the pasta is al dente. Drain and combined with the cooked rice. 3. Heat the butter and cook the onion until golden brown and crispy. 4. 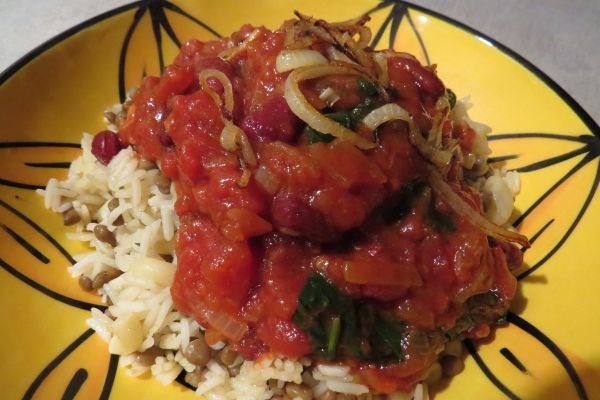 To serve, divide the rice mixture into bowls and spoon over the tomato sauce. Garnish with the crispy onion. 1. We added spinach leaves to our tomato sauce. We also had some kidney beans in the fridge, so we added those as well. 2. We didn’t have cherry tomatoes. I used a 800 gram can of chopped tomatoes. 3. I think I’d garnish with parsley or fresh coriander in the future, rather than the onion. Verdict: Delicious! I will definitely make this dish again. 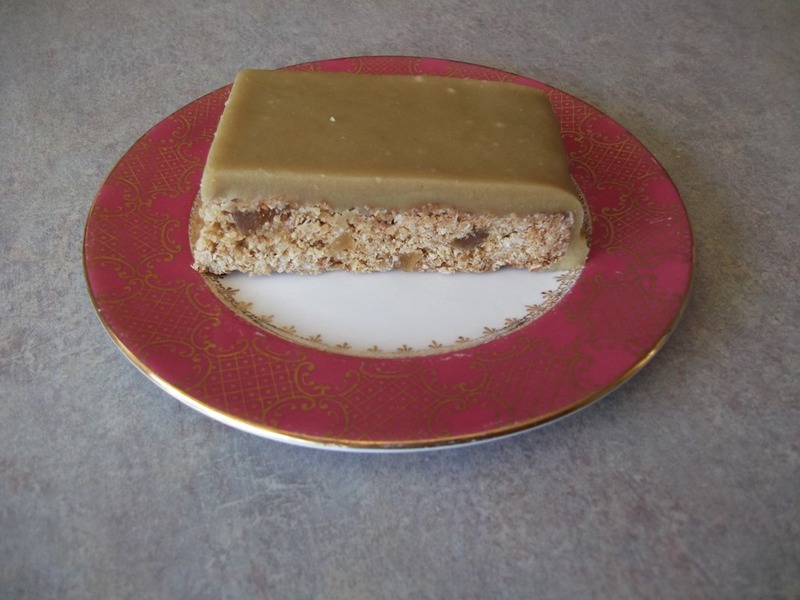 I really, really like Ginger Crunch, and I’ve been on the lookout for a good recipe for ages. 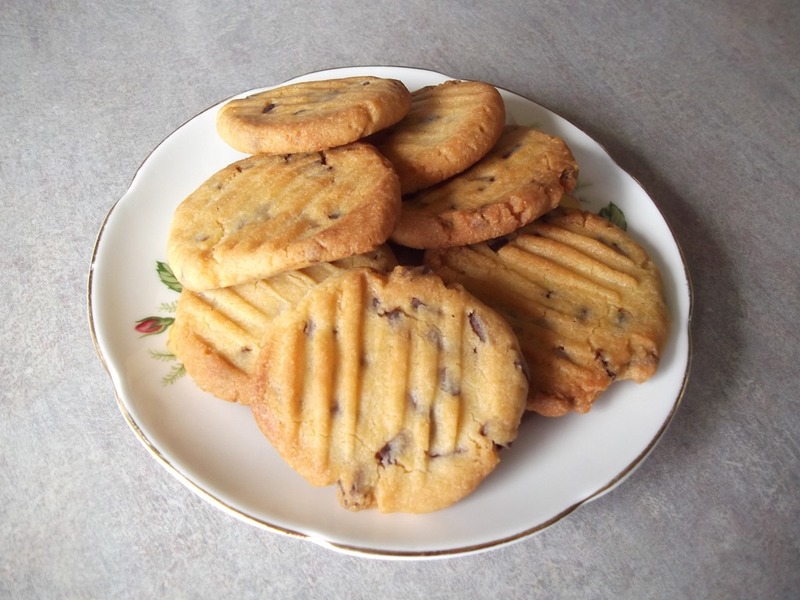 This recipe comes from the recipe book A Treasury of New Zealand Baking and is from Jo Seagar. I liked this recipe because of the super gingery flavor and the fact that it has wholemeal flour, which makes it feel healthy…even though it isn’t really. 1. Melt the butter, golden syrup, and sugar together in a saucepan. 2. Place the other ingredients in a bowl and stir in the melted ingredients from 1 above. 3. Preheat the oven to 180C. Line a slice tin with baking paper and flatten the mixture into the tin. 4. Bake for 20 minutes until golden. 1. Melt the butter and golden syrup together then add the ginger and icing sugar to make a frosting. 2. Spread the topping on the warm base. 1. I added a little extra icing sugar since the frosting ran off the base the first time I made it. I put it in the fridge the second time and didn’t lose my frosting. 2. 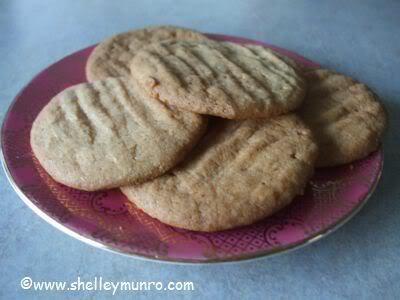 This is crunchy and gingery, although a little sweet. It was delicious and I can see myself making this often. 3. I used bake instead of fan bake, and the 20 minutes was the perfect cooking time. Are you a fan of ginger?